12-month supply $279.99 Save Over 50%! The consequences of a lack of sleep are much more severe than merely tiredness and diminished performance the next day. A night of proper sleep supports the ability to maintain a healthy body weight, blood sugar level, cardiovascular health, and mood. A lack of sleep can have a devastating impact on your health. Stress, today's fast-paced lifestyle, and numerous other things can all affect your sleep. Thankfully, Sleep Sure Plus is designed to help promote optimal sleep and restfulness. It uses a variety of ingredients to support healthy, restful sleep. The most important ingredient is melatonin. Melatonin is a hormone that is essential for the regulation of the circadian rhythm (the internal clock of the body). It is normally released at night, making it easier to fall asleep. In addition to melatonin, Sleep Sure Plus contains valerian, one of the best natural ingredients for promoting rest and relaxation. Sleep Sure Plus also contains 6 other ingredients to provide well-rounded support for a restful night of sleep. WARNINGS Consult a health care practitioner prior to use if you are currently taking any prescription medications or have any specific medical condition. Do not drive or use machinery for 5 hours after taking. Do not use with alcohol/sedatives. I have experienced troubles sleeping over the last 2-3 years. I have tried many natural sleep products. Unfortunately they did not help. I have not felt good about this, however since trying Sleep Sure Plus my sleep at night has improved, and I sleep more soundly. I had troubles sleeping, so I ordered a 1 month supply of SleepSure Plus and I was pleasantly surprised! Quickly noticed the benefits. So I immediately ordered the 3 month special before my 1 month supply was over. I will be 88 years old in August, and I have had some troubles sleeping for many years. After learning about SleepSure I decided to try it. I took SleepSure for three weels and wasn’t sure if I liked it or not. But, decided to keep using it a little longer. By the end of the fourth week I knew it was for me. 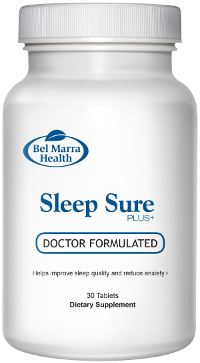 I have now taken SleepSure for several months and feel it helps keep me well rested. I have always been a poor sleeper and have tried many different sleep supplements to help me sleep better, but had very little success until I tried SleepSure Plus. I won’t be without it now. Many thanks. In the past year I have had trouble getting a good night sleep. I have been taking your Sleep Sure Plus and am very satisfied with the product. I will continue taking it.